Living in a co-operative housing society among other members can be an enjoyable experience. However, it is not uncommon to have disputes and apartment complex member complaints. The complaints can be of various types and may be about violations of certain regulations which then require to be reported to the managing committee for further investigation. A lot of times these quarrels may be due to issues such as using common spaces, littering, hygiene or repairs, high noise level and much more. Many such petty and serious housing society members problems need responsible decision making by the managing committee. At the same time, it is not feasible for every apartment member to attend every meeting or for that matter even notify the committee about violation of regulations by other members. 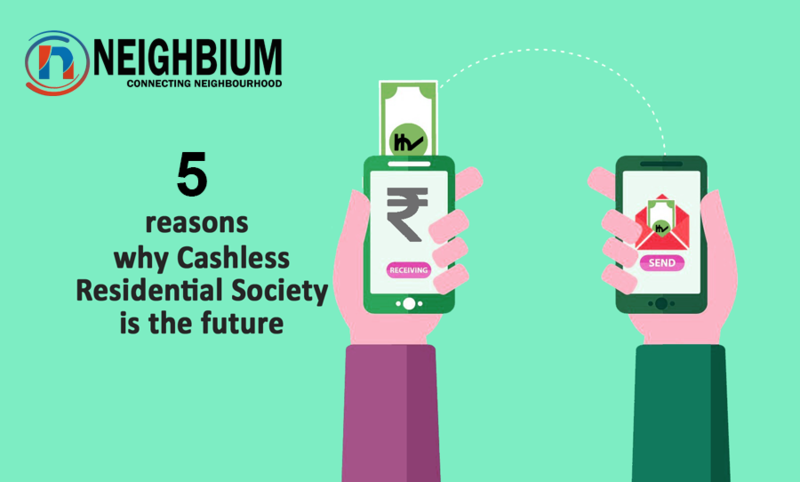 All of these concerns can now be easily addressed in a timely manner by downloading the Neighbium app. Our app features a Society Help Desk. which allows you to track apartment complex member complaints, keep a record of requests and suggestions by different apartment members, and helps reduce outages and manage the complete lifecycle of society tickets. Neighbium allows you to perform following operations. Private complaints refer to complaints which remain between the flat members and the management committee. They are hidden from other flats members. Using the Neigbium app, all private complaints can be raised effectively. Most often apartment complex member complaints are not completely resolved or are difficult to track to completion. Neighbium allows you to raise a ticket and submit a complaint anytime via the society help desk. 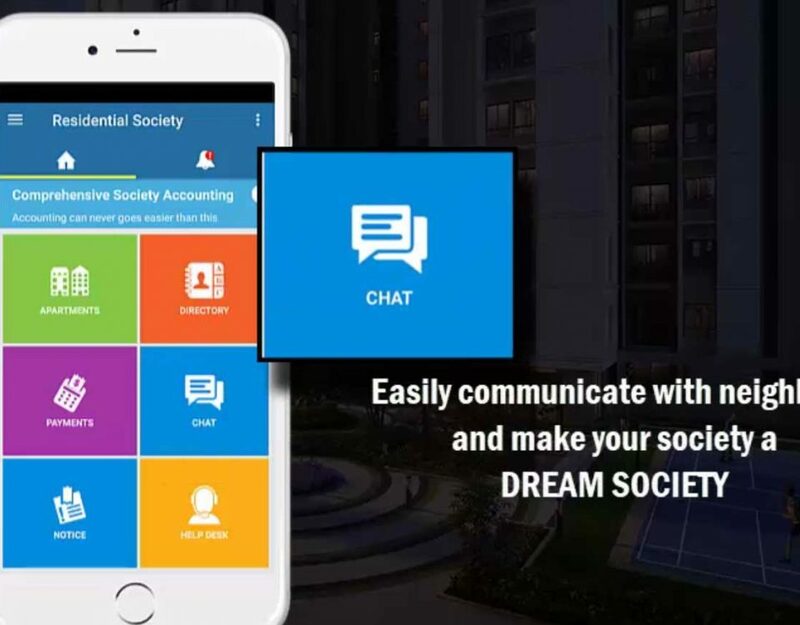 Also if you want some changes to be implemented in the functioning of the society, you can share your suggestions freely using the society helpdesk. 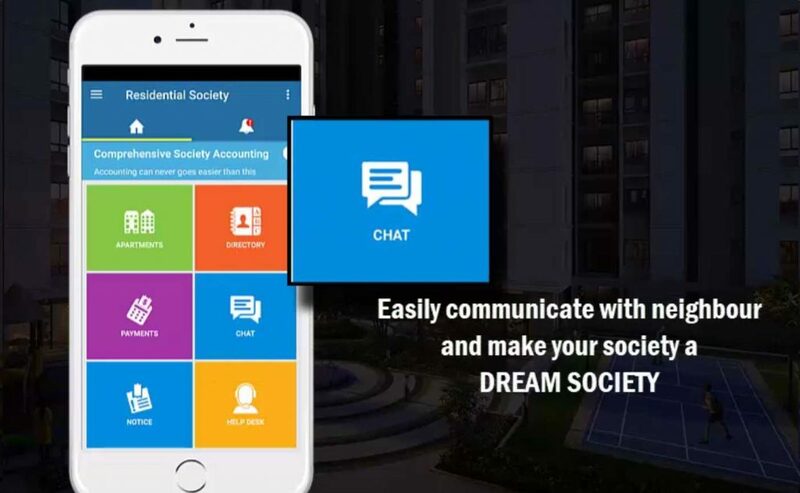 When apartment society members problems are dealt with in a timely and accountable manner the members of the society will be content thus fostering peace and prosperity among members inhabiting the space. 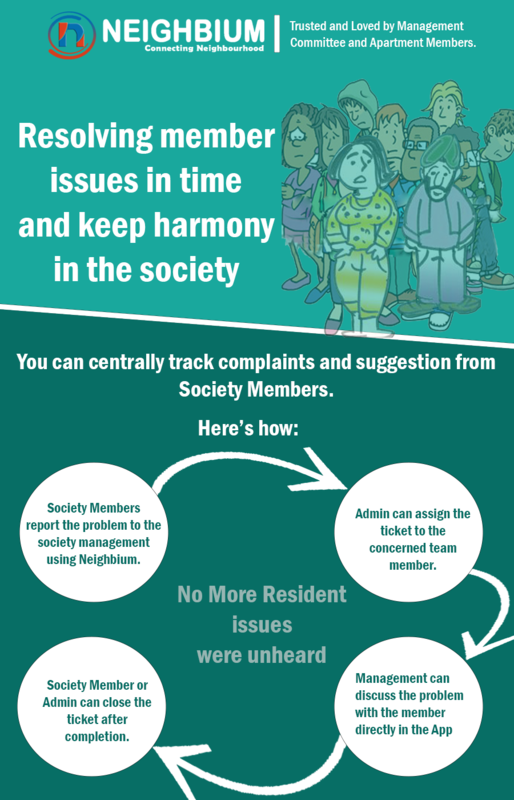 After any society member has filed a complaint, the next important thing is to follow up with the society managing committee. The app can help prevent effective follow-ups. Using the app, you can track the status and the progress of pending complaints, and keep a check on your complaints, both private complaints and community complaints, until they get resolved. If the complaint raised is common for all members. For example, if the security guard is not acting responsible or found sleeping during the critical hours, then apartment members can mark those tickets as community tickets. Every flat member will be notified about this issue and they can provide their comments on the issues using the helpdesk. A complaint or an issue, that you raise, stands no value or importance if you do not support it with the necessary and valid proof. Overflowing tanks, leaking pipes, menace caused by stray dogs, an incorrect clause in the agreement etc can be all documented, photos can be attached and shared using the app helpdesk to justify and support your ticket. These documents will provide a strong support to the ticket that you raise and ensures speedy resolution of the same. The documents that you attach can be the backbone of your ticket. 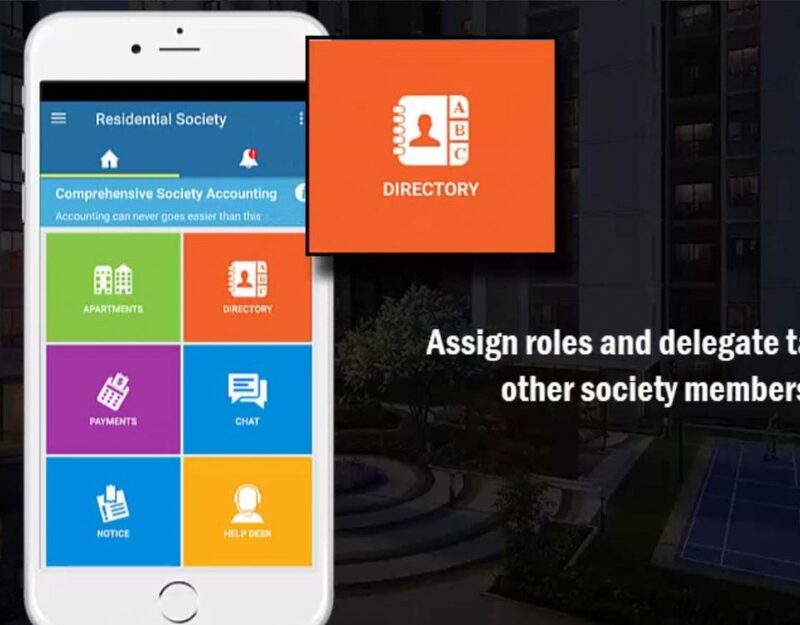 Finally, not just raising tickets or apartment complex member complaints but our app helps the society and the society members to manage the complete cycle of the raised concerns. 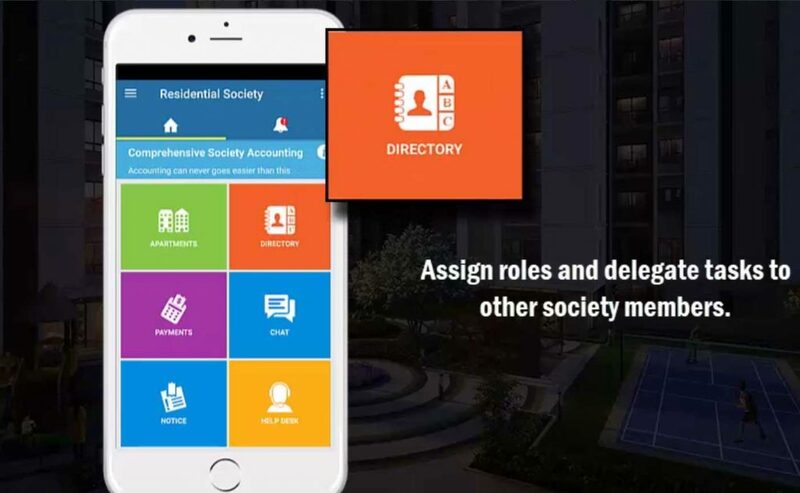 Our app assists you at every level of conflict management and issue resolution and helps you solve all apartment society members problems on one platform. The blocks or hurdles in the forms of delays in communication, lack of documentation, follow-ups etc can be overcome due to the smooth and structured method on which the app works. Conflicts in a society where humans reside are inevitable! Neighbium can help you manage and resolve them better, faster and smoother.We all love peace, don’t we? With the Neighbium app all your woes can come to an end. This centralised software will take care of the complaints, suggestions and requests. It is an effortless, efficient and effective way of dealing with society concerns. A happier and peaceful society is not just your dream but ours too.